ctive I can see that the longer and more often we play together, the better our scenes become. One word you hear a lot of is mindset. When everyone is on the same page mentally scenes can just flow. It’s communication at its silent finest. But how did they, you or I get to be such great improvisers? I went searching for the answer and I found the answers by research and within myself as I determined that a great improviser exhibits the same traits as great human being. Since I know how I like my humans (crunchy and with ketchup). Whether improviser or human, I think the best thing is to listen to others. The importance of this was personally felt by me, when the green football hit me in the head while somebody yelled lasagna, because I stopped paying attention during warm up games. A great improviser and human, Yes Ands!, on stage and in life no matter what your partner (me) asks. In a recent Playground, I was doing a scene and asked my partner if he wanted to rain dance. He went with it and it turned into a really enjoyable scene involving Greek Mythology (and giggles!). I believe as great improvisers and humans we all need to work together. I can’t think of one particular example, but more like 1000. We are all grown-ups, most of us, but if you’re old enough to be in here, you’re old enough to follow the rules. We are all expected to play well together and take turns, just like in kindergarten. I believe a great improviser/human radiates good energy. We’re not having kumbaya circles, but no one has yet to make me cry. As a matter of fact, I have yet to not be laughing and in a great mood at the end of the night. A great improviser and human should be silly. Perhaps I picked this up from being a stay-at-home mom and playing with kids as they've grown up, but I've always loved silly. And as long as I live I will never forget watching a show of Yadda Yadda Yadda that involved day-old birthday cake being eaten off the floor by party guests who had over stayed their welcome. It was actually at this moment that I realized I can do this! It wasn't the day-old birthday cake. It was the presentation and collaboration of the improvisers that brought back memories from my own younger years. And they were funny. Great improvisers and humans make their partners look good. Whether on stage or in life, it is our job to make our partner shine and prove to the world that we’re in this together. For in the end, that may be all we have. Wow! The Playground has grown.....quickly! Every week the Playground has grown in size, and we're so excited to see so many from Roseville, Rocklin, Auburn, and even Sacramento spending their nights laughing, and having fun at Blacktop! We're all about having fun, so Blacktop Comedy is now offering The Playground: Improv for Everyone, Thursdays AND Sundays! 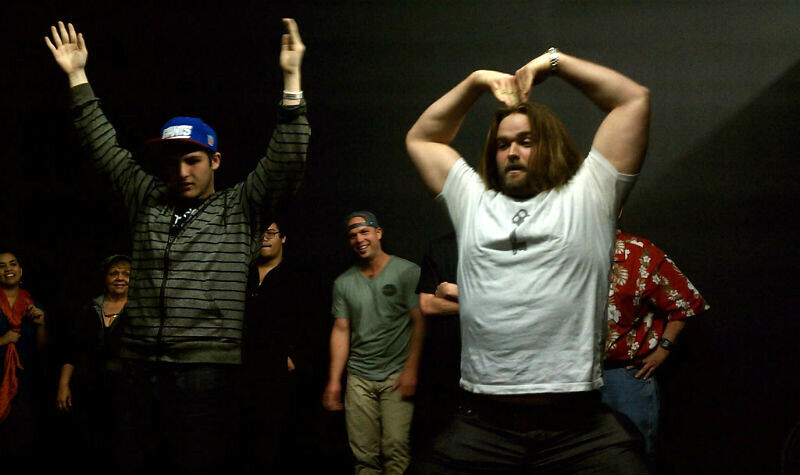 Join us Thursdays and Sundays for improv games and general awesomeness! Interest in becming a better comedian, actor, or public speaker? Need more confidence? Join a very supportive and encouraging group of improvisers every week at The Playground: Improv for Everyone! A chance for new and expereicned improvisers to work together, and learn improv games you would see on TV, like Whose Line is it Anyway? WARNING: You will make friends and laugh a lot. Be OK with that.